When our old cat of 16 years died we missed her so much we decided to look for a pair of elderly cats. In a few years we’ll want to be doing more travelling, so we didn’t want the long-term commitment of a young cat, and two bonded cats would provide company for each other while we’re out working. When we discovered Loki and Monty online, we thought they would be ideal, and so they are. They settled in immediately and are wonderful company. I renamed Monty ‘Idunn’ (or Edie for short), after the Old Norse goddess of youth. As Edie is 17.5 years old, I thought it would be a good name, and she is amazingly fit. The cats were apparently together from kittenhood and remain inside cats, though they do enjoy our courtyard when we’re home. They sleep on our bed and are just delightful and funny company. 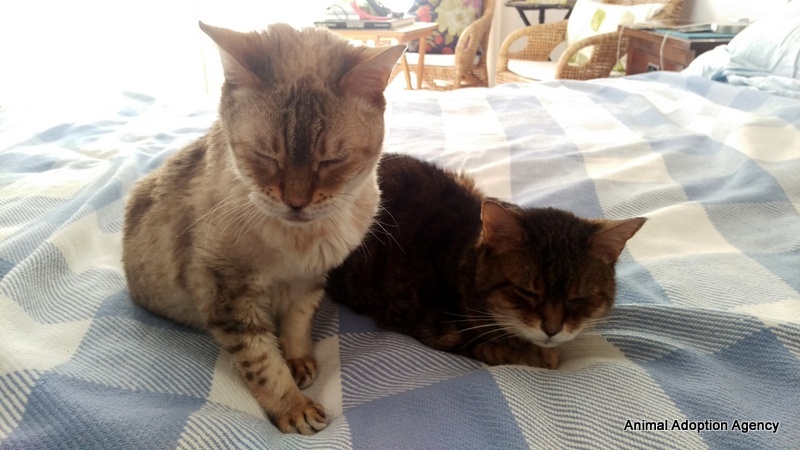 We know that with elderly cats, things can happen suddenly, but we hope for a few years with these two lovely cats.